Anyone have experience with stripping paint from older Weaver units? I have an old GP38-2 (the first design with the horizontal can motor) sitting in 91% isopropyl alcohol right now, but after 20 hours the paint still seems rather unaffected. Any suggestions? Since Weaver was also the purveyor of Scalecoat Paints....now sold by Minuteman Scale Models....and that line of products has Wash Away (S56), a paint remover, perhaps it might be a solution (pun intended) to your problem. Loved your Dad! Rubbing alcohol often works the literature says. I recently worked o n a lionel ore car and had to use mr. clean pads and brake fluid. It was a bit of a pain! I read about using brake fluid. Just nervous about the potency. How much does it cost for a bottle? I have a 5 year old bottle, lasting forever since I don't use a soak tub. Amazon has a quart for 6.38 and you can reuse if you soak. I use Kroger $1 yellow gloves. beware, This method is guaranteed to cause cancer if you live in California. Weaver paints are much easier to strip than MTH painted items. As suggested above use the paint remover wash away or go-to your local hardware store and try a sample of paint remover that is stated to be safe with plastics. I used the brake fluid method once on a old Williams TM and while it eventually removed the paint, it took days of soaking to do so. Then one has to remove all the residue fluid as well...not an easy task. I use DOT3 brake fluid. Find it at your local auto parts store. It is inexpensive. I have found that soaking a part works best. I have never had any project take "days" to remove the paint. Paints are very different. Some will actually fall off, some take a little scrubbing and some need to soak overnight. I have tried every thing anyone on here has ever mentioned but "Wash Away" (but I will give it a try the next time I need to strip paint) and I have found nothing works better or more easily than brake fluid. Say what you want, it has worked for me for 40+ years! I would stay away from commercial paint removers! I have seen them melt plastic. Swim At Your Own Risk! 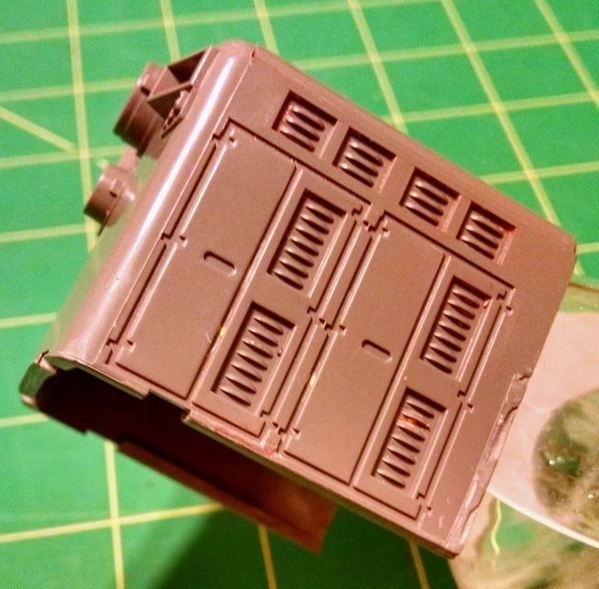 I will say this, if you have made the grave mistake of painting a plastic model with lacquer paint, you are on your own and you deserve the mess you have created! If you use a laquer based paint to paint plastic, you need to FIRST spray the piece with a sealer so the laquer will not attack the plastic. Best stuff that I have found, At Walmart or Auto-zone. Use it full strength for faster stripping or dilute, will not hurt plastic. Blackened aluminum horn on switcher shell that I let soak to long once. It's also bio-degradable. I'll never use anything else to strip paint off plastic. I did this same thing a few years back (also to a Weaver GP38-2) and had the exact problem with the alcohol. Someone else answered with Easy Off Oven Cleaner (bought at HD or similar places). Here is the thread: Stripping, Detailing, & Repainting Project (Weaver GP38-2) On page two is where the Easy Off is mentioned. I was afraid to use it at first, but it definitely worked and have used it multiple times for other train projects since. 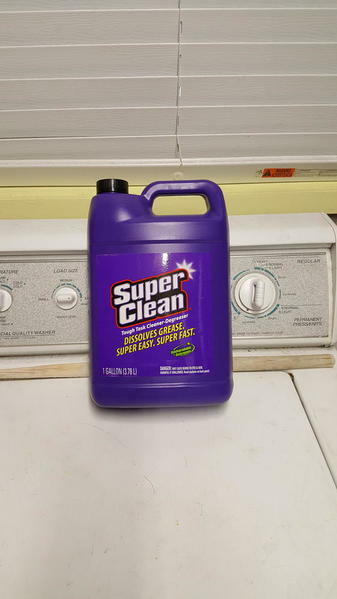 The only thing that "Super Clean", Purple Power", etc. ever took off one of my models was the thin red stripe on a silver Williams GG1. It never touched the silver paint and that was after soaking for three days! But I can confirm that it will take all of the oil out of your skin leaving it high and dry and in need of skin moisterizer! Easy Off? Only made an ugly mess of things and damaged the plastic. That's strange Big Jim, I've used it to strip postwar shells and strip painted plasticville with no problems. It really worked for me on a Mikes shell that someone painted but didn't hurt the original paint underneath, so maybe it doesn't do so well on some factory paint. That worked for me in that case because I was trying to save the original paint. You are right, it will kill the moisture on your hands! Yeah Easy off changes the plastic, I just haven't had much luck with brake fluid, probably to impatient to wait long enough. I have used Purple Power on an old Weaver GP38-2 (single horiz. motor) and it worked fine overnight. Depending on the vintage of the Weaver it may not work since paint has changed. I have a small paint stripping project that I need to do. I've been wanting to try the "Wash Away" stuff for a while now. So, I ordered some last night. It is EXPENSIVE (definately something the cheapskates here will moan about ), but, I'll give it a try. I'll report back on its results when I can. The alcohol method requires some elbow grease, but avoids messy and caustic chemical strippers that will require an alcohol bath anyway to produce a paint ready shell. Leave the shell submerged in alcohol for a day then scrub with a tooth brush. Repeat for the inevitable hard to get places, then a final alcohol rince and let dry. Result is a sealer/ paint ready shell undamaged by coarse abrasives. Scuffing pads and paper are a definite way of removing fine detail relief and should be avoided. The Easy-Off I wasn't really keen on using, looking back now, I wish I would've just started with that and didn't by 3 jugs of the alcohol. Yes, there is a little bit of a chemical smell, but in my split level house, the smell didn't leave the area I was working in. Much easier and faster than the alcohol for sure. My order for "Wash Away" came in. After hearing about this paint stripper here, I have been wanting to give it a try. First of all, it is very expensive. $18.95 for 16 oz. Plus another $11.33 for shipping. I had a couple of small pieces to try it out on to see how it compared to my age old stand-by DOT3 brake fluid. 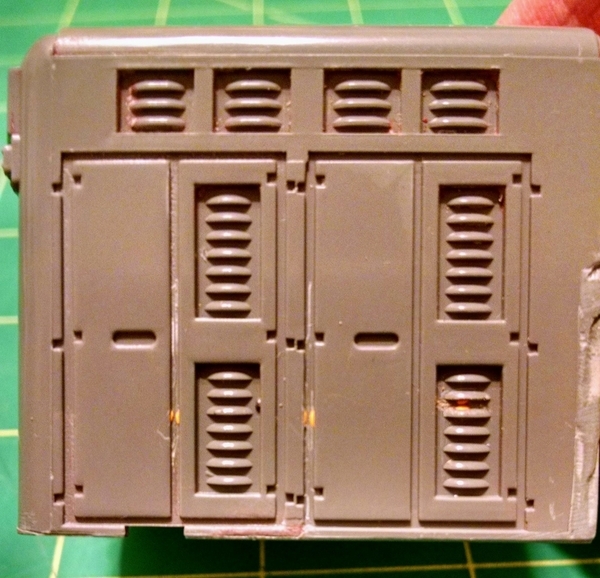 If you haven't been following along, nothing else that I have tried ever came close to stripping paint from plastic as well as DOT3...NOTHING! Upon opening the bottle, I was greeted by what I thought was a familiar smell. The instructions to "Wash Away' say to soak the part for ten minutes, remove and scrub vigorously under warm water with a fine bristle brush. Rinse thoroughly. Repeat if paint remains tiny crevices. Before doing that, I wanted to see how it worked on lettering. I took a Q-Tip swab, soaked it in the solution and started rubbing. Each set of lettering came off in less than five minutes. 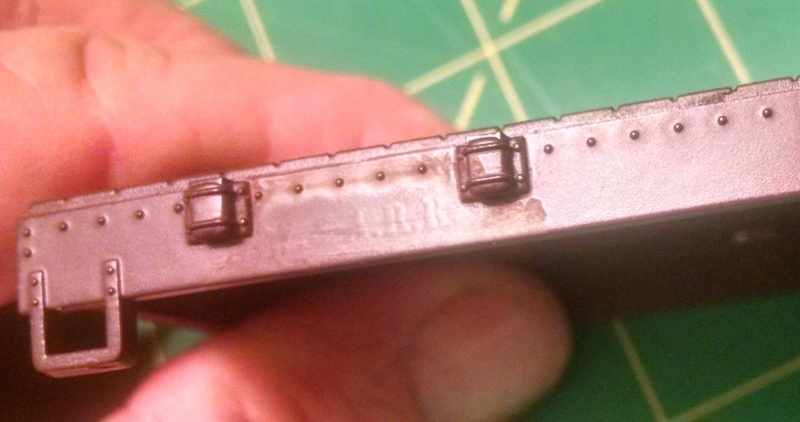 With the lettering removed, you could still see the remains of heat stamping. I then took the car and soaked it for about a half hour. Scrubbing with a toothbrush appeared to take off what little paint there was on the car along with the heat stamping. I am guessing that there was only a clear coat on the car as this is the color of the plastic. Doing this hands on, I was also greeted by a familiar feel to the solution. That was pretty easy, so, I proceeded on the the next piece that had much more paint to be removed. This is a partial shell from a Williams Lackawanna FM. Sorry, in my haste, I forgot to take a before picture. There was a Lackawanna logo under the headlights. I first tried to use the swab to clean it off and quickly found out that it was actually a sticker! I peeled that off, then laid the hood in the solution and rolled it over and over to coat the hood, then let it set for about twenty minutes. After soaking, I again started in with the toothbrush. The red was the first color to come off. With more soaking and scrubbing the grey started to come off. Hmmm, this is again very familiar. The paint was coming off with the scrubbing except for the yellow stripe. Not unusual. Things like this tend to be a bit stubborn at times. So, I took the solution and put it in a glass so that I could get the entire hood under cover and walked away for about forty five minutes. When I came back, more scrubbing took most of the yellow stripe off. It just needed some time to get under that yellow paint. As you can see, the hood came out very clean with the exception of a few hard to get at places where the yellow paint wants to stick. I clean those spots up with a hobby knife later on. Now, remember that I said there were some familiarity's while I was doing all of this? and, it performs very much like my DOT3. My conclusion is that it works. It works safely with no harm to the plastics involved in my unscientific test. It works just as well as my DOT3. And, it works better than all that other stuff that you guys try to strip paint with! One other thing. 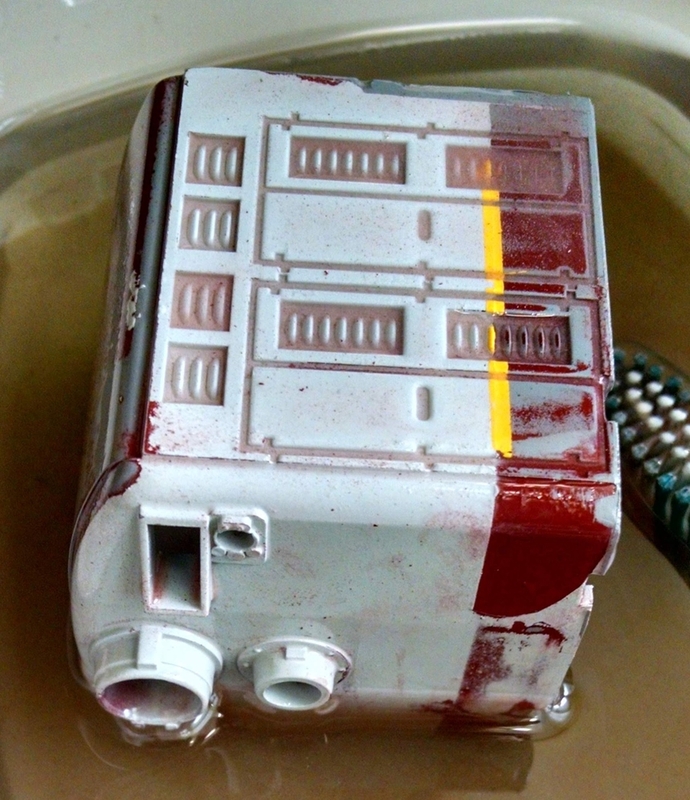 Don't waste your time letting your parts soak for just ten minutes and the wash them off like the instructions say only to find that all of the paint hasn't come off and you have to go back and do it again and again. Let the part soak a while, then start scrubbing with your toothbrush while the part is still in the solution. Work with it until all of the paint is off, then, go clean up with soap and water. Big Jim, thanks for undertaking this product test for us; absorbing the costs, shooting and editing the photos; and, posting the results here for our collective benefit. Did the product come with a Material Safety Data Sheet? Or have you tried to secure one? Might make for an interesting comparison to your DOT3 product. No data sheet. Just the standard instructions for what to do if a Californian wants to drink it to get high! Anytime I run into a project where 91% won't touch it, I just paint over it. Obviously it's durable enough so just paint over it. If you're trying to go light color over dark color, just spray it light grey as a primer. Rather than attempt to strip a good factory finish, I've just scuffed it with 1000 grit sandpaper and went on considering it as primer bonded to the plastic. Out of ALL the issues I've had with trains, never had paint peeling from Atlas, Lionel, MTH, Weaver, Sunset, etc. And last as GRJ mentioned is Brake Fluid it is particularly good on water based paints and won't attack most plastic or metal, which can't be said about Lye. But it won't remove all paints at least in a timely manner. If you read my post above, that took less than a few hours and it would have been less if I didn't have other things to do. It has removed all of the paint from any model that I needed to strip. And, it won't eat the skin off of my bones. "Tie a nylon cord to the body shell and lower into the solution, every 6-8 hours scrub with a soft nylon brush most paint will be off in a day or two." When lye is mixed with water, heat is released, so the container used to mix lye in has to be able to take that heat. Lye can burn the skin and damage the eyes in the dry or wet form. It also releases fumes, when mixed with water, that can harm the lungs. If swallowed, lye will burn the esophagus and can cause death. Children and pets should not be allowed around lye. I've used most all chemicals listed above over the last 40 years stripping paint off model trains and now my method of choice is a blasting cabinet using soda by Amex. Cleanup is simple esp. compared to disposing of used chemicals and yes Dot 3 brake fluid will burn your skin..and I've seen it delaminate plastic on certain train products. 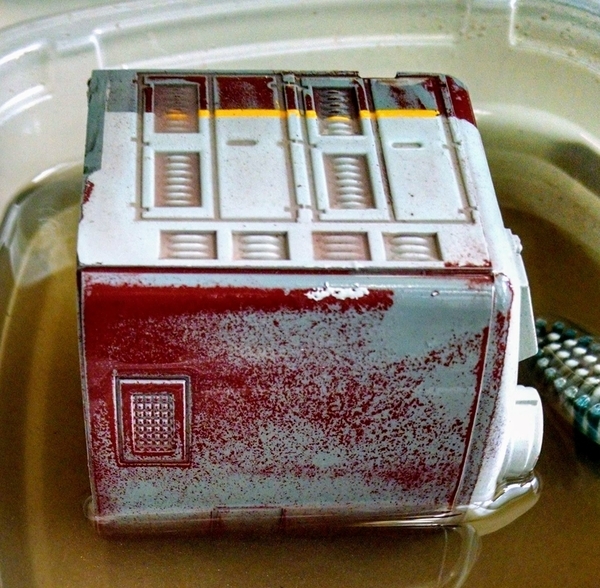 Back in the 70's when I was repainting dirt cheap 2343 Santa Fe's I would mix up a really strong solution of TIDE and water. Soaking overnight usually made the paint fall right off with little effort. However I don't have a clue how it would work on newer paints and plastics. As I figured, you missed the point entirely! It was all in the first paragraph. Whoa, I didn't realize how many replies appeared on here since I last checked in! I ended up using Scalecoat wash away as was suggested rather early on. It did the trick. I just posted a new topic regarding the work I've done on this unit. I came to the same conclusion Jim. Ten minutes ain't enough! I have almost two hours of scrubbing (with intermittent dipping to keep the surface wet with wash away) put into the frame, and there's still a bit of paint left on it. I know that sounds like a lot of time, but keep in mind the piece is quite large and the treaded walkway is rather stubborn in terms of paint removal.